We fabricate our dentures and overdentures from only quality materials, regardless if you prescribe our standard product, or upgrade to premium materials. The various options of materials and parts available, combined with our extensive knowledge and experience, leave no case unconquerable. Ask how we can assist with your next treatment plan. Complete dentures replace a person’s missing teeth when the entire upper or lower arch is missing, whether the result from decay, periodontal disease, or injury. Without support from the denture(s), facial muscles sag, making a person appear older. Replacing an edentulous arch with dentures from Global Dental Solutions will benefit the patient’s appearance and health. Our dentures are made from only quality acrylic and resin teeth, and are fit precisely to the impression or model provided by the Doctor. Choose our standard acrylic, or upgrade to premium Lucitone 199 processing. Likewise, we can also provide premium teeth such as IPN, Bioblend, or porcelain denture teeth. When a patient with existing dentures has a history of breakage or fractures, prescribe a cast mesh subframe for the palate and ridges. When embedded within the denture acrylic, this cast mesh structure, which we wax and cast specifically for the case, will provide added support to the patient’s denture, aiding in the prevention of fractures. Depending upon state law in your location, patient identification may be required for the denture. Simply inform us, on the prescription form, the name or social security number you would like embedded within the acrylic and we will place it accordingly. Aesthetic and true to life dentures must take into consideration the proper arrangement of teeth, the contours of the natural tissue, and the patient’s characteristics. This is achieved through masculine or feminine tooth mould and arrangement, correct lip support, festooning, and determination of a pleasing smile line. In addition, we use cross-linked, 5 layer denture teeth for excellent shading and a natural look with superior wear resistance. Full feeling: When new dentures are first placed in the mouth they frequently feel fuller, and it may not seem like there is enough room for the tongue. When a person has been without teeth for a period of time, the inside of the cheeks and tongue can become reversibly slightly fuller. When a new denture is first inserted, this slight fullness may feel enormous. In actual fact it is not, and the full feeling will usually go away very shortly if an individual does not dwell on the sensation. Previously unsupported sunken facial structures and muscles will usually be supported with a new denture to a normal position. These facial tissues adapt rapidly to their regained normal positioning and will feel less strained and subtler shortly. A more youthful appearance results in many cases. Phonetic difficulty: When a person is used to producing speech sounds without teeth or with an old denture that has no longer preserved proper jaw relationships, they generally have adapted their speech in such a way as to accommodate these abnormal conditions. However, when correct jaw relationships and contours are established again with a new denture, there may be some difficulty producing certain speech sounds clearly, and teeth might even click together in some instances. This is temporary. If an individual makes an effort to speak slowly and clearly, pronouncing words very precisely, the tongue and other muscles will quickly adapt to produce clear speech. It is often useful to read a book or newspaper out loud, carefully pronouncing each word precisely. Sore spots and irritations may develop as a new denture settles-in. This may require some adjustment to the body of the denture, and, more often, careful adjustment of the bite resolves these types of problems. At times the jaws may feel tired and soreness can develop. Taking dentures out to rest the mouth for a time frequently helps resolve these problems. Regarding retention: Tongue thrust is also known as a reverse swallow. If the maxillary denture pops out when the patient initiates a swallow, then it is likely that a tongue thrust is to blame, and not a lack of retention. An overdenture may be required for a patient that exhibits a tongue thrust, as many denture patients are elderly and are too old to have their swallow technique retrained. A specially trained speech language pathologist can confirm the existence of a tongue thrust, in the event the dentist cannot. *A majority of the information on this page has been provided by Dentsply. Top Quality… That’s The Lucitone 199® Promise. 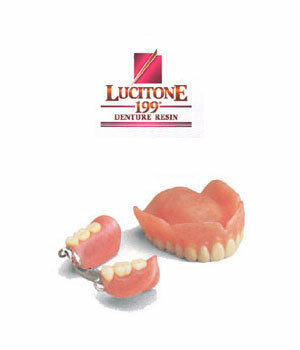 Lucitone 199®, by Dentsply, is the premium denture acrylic in the industry. Unsurpassed strength and customer preferred shading confirm Lucitone 199 as simply the best. Lucitone 199 assures unsurpassed impact strength. Vastly superior impact resistance, resulting in fewer repairs, means peace of mind for both dental professionals and patients. A premium product can command a premium price. While Lucitone 199 resin may cost just a little more per denture, many dental professionals have found they can recoup their costs ten times over – even as they continue to build a reputation for top quality at a fair price. For patients sensitive to conventional denture acrylics, we offer the option of processing our dentures using Lucitone FRS. An allergist can skin test patients for sensitivity to acrylic monomer. However, be sure to first rule out the possibility of a subclinical yeast infection. It is more common that a patient with an existing denture has a yeast infection than it is the patient is sensitive to the denture acrylic, as the monomer used to process the standard acrylic polymerizes the acrylic powder and becomes incorporated, thus being less reactive with the oral environment. Lucitone FRS, by Dentsply, is a thermoplastic injectable resin for use in creating both flexible partials and small to medium sized dentures. It is a monomer free material and offers superior flexibility, transparency for optimal esthetics, and excellent stain resistance. The FRS material also resists stress fractures. Its microcrystalline structure is easy to polish, similar to that of acrylic. Restorations manufactured using FRS are very light weight and comfortable for the patient. Light pink, original, and clear shades are available. Use Faskut® Luci-Sof® Burs. These straight handpiece burs are available in small (order #904763), medium (#904764) and large (#904765). Polish with normal procedures used for denture acrylics. This high-quality dental appliance is made from Lucitone® FRS™ flexible dental resin. Your dental laboratory has injected this nylon material for a precise fit. If adjustments are needed, please use Faskut® Luci-Sof® Burs. These straight handpiece burs are available in small (order #904763), medium (#904764) and large (#904765). Polish with normal procedures used for denture acrylics. 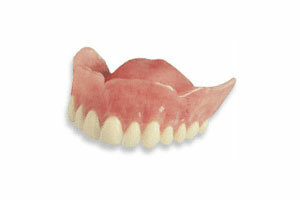 Interim dentures, also called immediate dentures, are placed in the mouth directly after remaining teeth are extracted. This approach is utilized when a patient does not want to be without teeth while the extraction sites heal and a denture is subsequently fabricated. Optimally, an interim denture is the first denture of a two-denture process and should be considered a temporary interim prosthesis until a second, refined and aesthetically enhanced denture, which includes a try-in stage for patient critique and approval, may be constructed after healing. 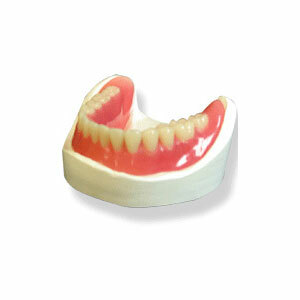 Our interim dentures can be processed with standard acrylic or premium Lucitone 199. The Cu-Sil® Transitional Denture is useful for saving mobile, isolated or periodontally involved teeth. It is comfortable to wear because it prevents stress to teeth often caused by torque-inducing metal partials. Cu-Sil® stabilizes, cushions and splints teeth with an elastomeric gasket that provides retention and seals out food. It is unsurpassed for comfort and aesthetics. There are no special tooth preps or impression techniques to follow with Cu-Sil®, and it allows low-cost add-ons, repairs and relines. Overdentures offer prosthesis retention for the patient suffering from retention problems with the typical complete denture, particularly those patients with advanced ridge resorption. Overdentures obtain their support from two or more abutments by completely enveloping them beneath the fitting surface. (The use of only one abutment is not recommended.) Overdentures offer these patients greatly improved retention and stability. The overdenture attachment can be placed in tooth roots that have been saved, or torqued into dental implants which have been placed to receive them. Please refer to the Root Cap Abutments, Stud & Bar Attachments, and Mini Dental Implants (MDI) pages of our website for more information regarding the different types of overdenture attachments.